Software-driven network packet brokers have made core packet broker functionality more cost-effective and scalable than ever before. Now, read how that same software-focused approach is enabling advanced packet conditioning with more flexibility in deployment. In the second part of their analysis of this new software-driven technology, ACG Research delves into the ways software is making pervasive network visibility easier to achieve. 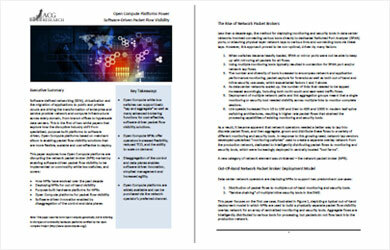 Software has made core packet broker functionality more flexible and cost-effective. Read how it’s revolutionizing the way advanced packet conditioning is deployed as well. Register now.